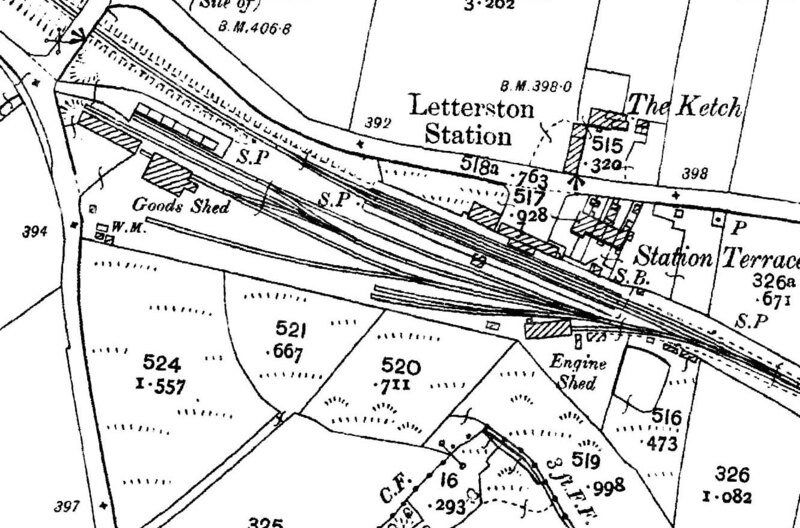 1907 1:2,500 OS map shows the layout of Letterston station after the opening of the extension to Fishguard. The original platform is on the north side of the line. The station building is seen with a small canopy over the platform. The building to its left is the stationmaster's house; the signal box (SB) is at the other end of the platform. The down platform has a waiting shelter opposite the station building. The GWR engine shed is seen opposite the signal box; the two sidings running past the shed probably served the 2-road carriage shed that was moved to Whitland in 1901. There is a large goods yard with four sidings, one of which passes through a goods shed. The siding opposite the goods shed was probably for livestock.